Once the Sprint Planning is done and the Scrum Team starts sprinting; they meet daily for an event called Daily Scrum. Daily Scrum is an important inspect and adapt opportunity for the Development Team. 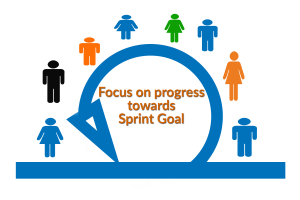 The purpose of Daily Scrum is to inspect progress towards the Sprint Goal and adapt the Sprint Backlog. It is a time-boxed event; time-boxed to 15 minutes, irrespective of the Sprint length. As mentioned earlier it is an opportunity for the Development Team to inspect and adapt their progress towards the Sprint Goal. It is not a status update meeting. The Daily Scrum is strictly for the Development Team i.e. only the Development Team participates in the event. People other than the Development Team may attend the Daily Scrum without participation. Immediately after the Daily Scrum, the Development Team or members of the Development team meet for detailed discussions. This is helpful to address any identified issues or to replan and adapt their work to meet the Sprint Goal. The Scrum Master teaches the Development Team to keep the event within the time-box. The Scrum Master ensures, if people other than the Development Team are present in the Daily Scrum, then they are not disrupting the event. Also, Scrum Master ensures that the Daily Scrum happens but the Development Team remains accountable for conducting it. What did I do yesterday that helped the Development team to meet the Sprint Goal? What will I do today to help the Development team to meet the Sprint Goal? there is no rule how to structure the Daily Scrum. The Development Team may decide how they want to structure Daily Scrum as long as it focuses on progress towards the Sprint Goal. In essence, Daily Scrum is a 15 minute time-boxed event for the Development Team to inspect and adapt their progress towards the Sprint Goal. Daily Scrum, Scrum, Scrum Events, sprint goal. Bookmark.